Opera Art Project Anniversary Collar scarf and hand warmers. The Edmonton Opera is having their 50th Anniversary this Opera Season. To help celebrate this wonderful moment and year I decided my designs for the Opera Art Project would be a combination of all 3 Opera’s in the colours of their 50th Anniversary theme. The Edmonton Opera started with their first Opera being Madama Butterfly and fittingly are topping off this year with the very same Opera. What a wonderful way to make tribute to all 50 years of incredible talent and hard work. 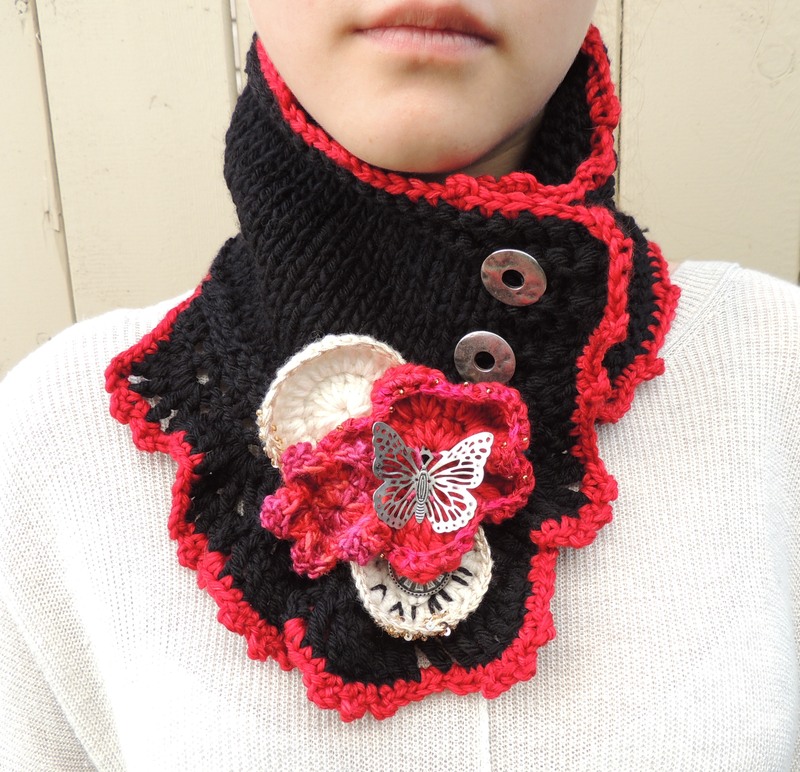 The Opera Art 50th Anniversary Neck warmer scarf is done in black with gold trim. The trim is made with 100% beaded silk for the Golden 50th Anniversary. 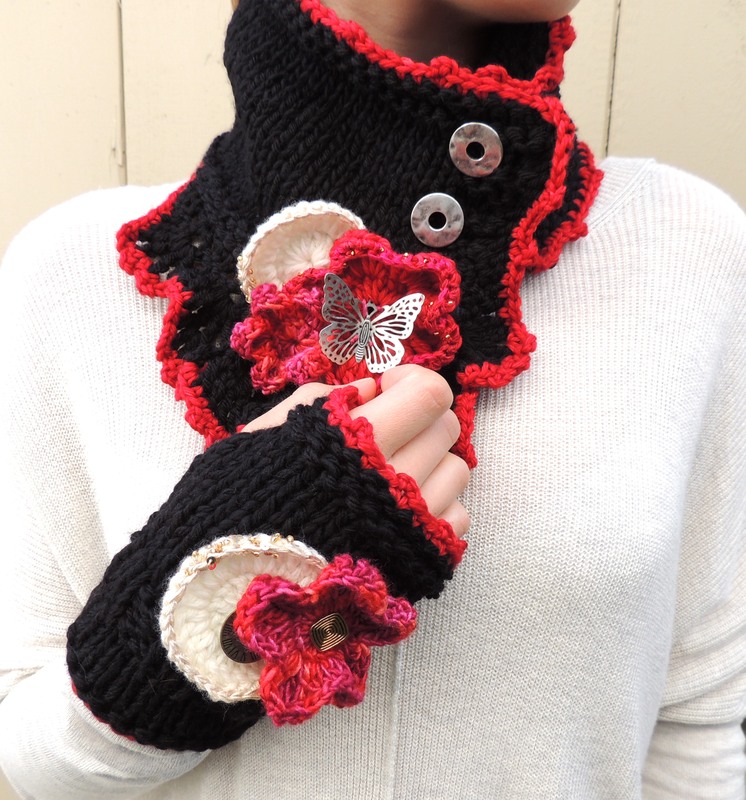 I made a second one in black with red trim the colour of the Cherry Blossom and other parts of Madama Butterfly. 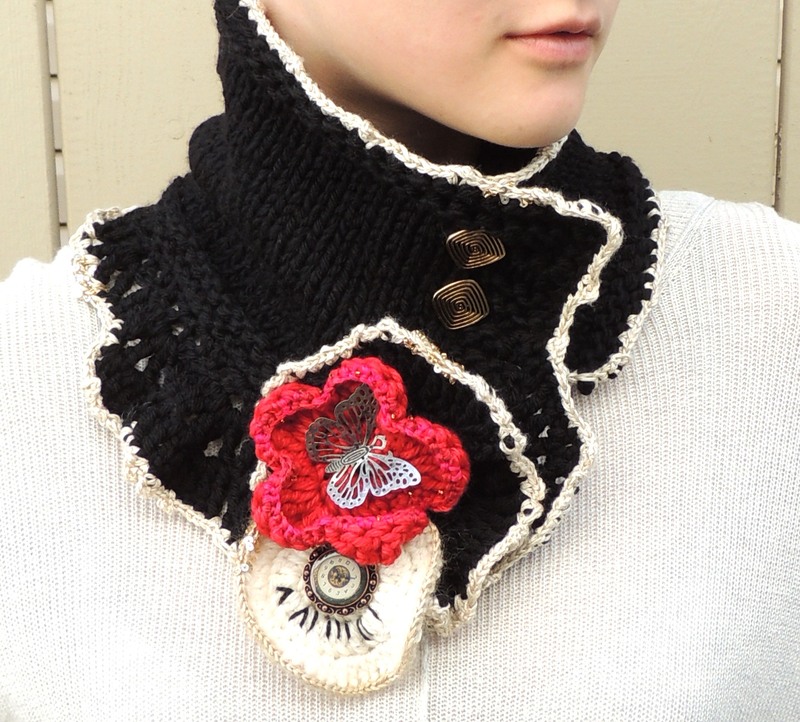 On each of these neck warmers you see the lace edge which symbolizes the “dance of the 7 veils” in the Opera, Salome. The Full Moon is also a big part of the first Salome, Opera this season. In the second Opera, Die Fledermaus, there is a pocket watch that has an important role and meaning in this Opera. I stitched some of the clock onto the Full moon on one neck warmer and on the other made a separate clock also on a white face. Each scarf has an additional metal clock face to add a unique touch to the design. The third Opera, Madama Butterfly is the season ender to celebrate 50 years. The Red Cherry Blossom is done in a merino and silk hand painted yarn and accented with a 100% silk beaded yarn. Cherry Blossoms are seen throughout this magnificent opera in addition I added a metal butterfly to each for this wonderful Opera. The hand warmers are designed in the same manner with mutual influence from each Opera. There will be other styles for each of the 3 Opera’s this year so pop by again for a peek at what I am working on. There will be pictures of some of the upcoming designs and works by the Opera Art Artists soon at this link above. That is amazing!!!! I love the blend of different elements!